Last monday I decided to upgrade some of the systems that I maintain to their latest version. When doing so I saw that there was a new WordPress version released: 3.6. The release is codenamed Oscar, and it’s now rolled out on this website, and on odetocooking.com as well. As a user, you’ll notice no difference at all, though. 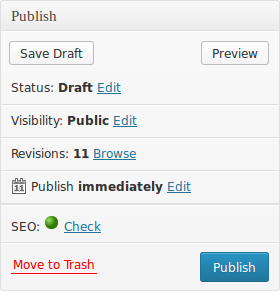 All the new features are done in the backend, to make authors more productive or happy. One of the new features is Post locking. This means that when one person is working on an item, and someone else tries to edit it, they get notified. This will reduce the chance of simultaneous editing from becoming a problem. This feature is not so interesting for me, since I’m the only author on this blog. For my use-case the nicest new feature are revisions. Every time you press “Save Draft” a new revision is created, giving each blog post a bit of history. Once you have more then one revision, you can see your revisions next to your post, and by clicking “Browse” you go to the compare revisions screen, shown below. Also take into account that newer versions probably have more security patches, and are more likely to receive more in the future. Also, if you want to make customisations to WordPress, like your own theme, it’s more likely to keep working if you use a recent version. As usual, the WordPress Codex has a nice guide on upgrading your WordPress installation. If something broke, let me know :). put this short article together. I once again find myself personally spending way tooo much time both reading and posting comments.